Most people focus on how much money is in their portfolio instead of the amount of retirement income it will create…. for life. That’s why we focus on the 4P’s Proper Planning Provides Peace. We will help you develop your own customized financial strategy and walk you through your retirement options to see which ones might fit your needs and goals the best. 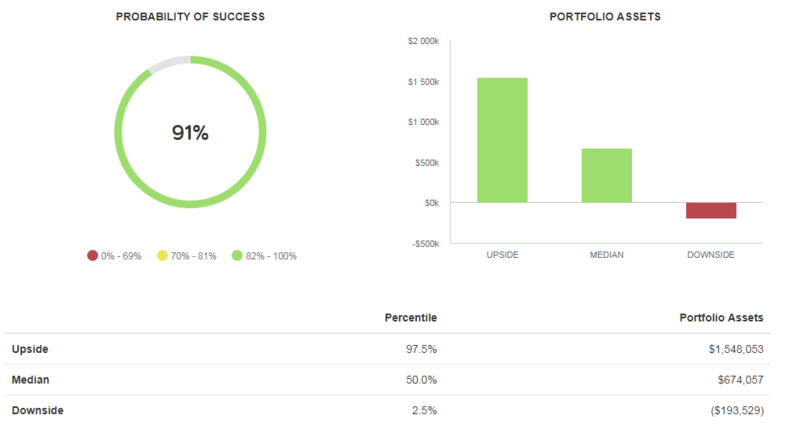 Has anyone ever tested your portfolio for its probability of success? Planning your financial life and your retirement can’t be a guessing game. A goal without a plan is simply a wish. There are various online tools available to tell you how long your retirement income may last based on multiple variables but that is NOT a plan. We will tell you what your exact percentage of success is with your current plan. This will tell us if your plan will work or not. For example, it may turn out you have a 70% chance of achieving all of your goals and not running out of money. If it is not going to be 90% or greater, or a level you are comfortable with, then we need to evaluate other strategies. We will test any other ideas you may have and maybe a few of our own, so you can see the results in advance of making any decisions. If your retirement plan is not going to work when do you want to know? We are focused on building long lasting relationships with our clients and we will be with you every step of the way on your journey. Our mission is to provide you with greater financial confidence and peace of mind in your retirement.